The Canon 300mm f/4 L (non-IS) from the 1990's is one of Canon's discontinued, older and slower telephoto lenses. It does have UD glass. 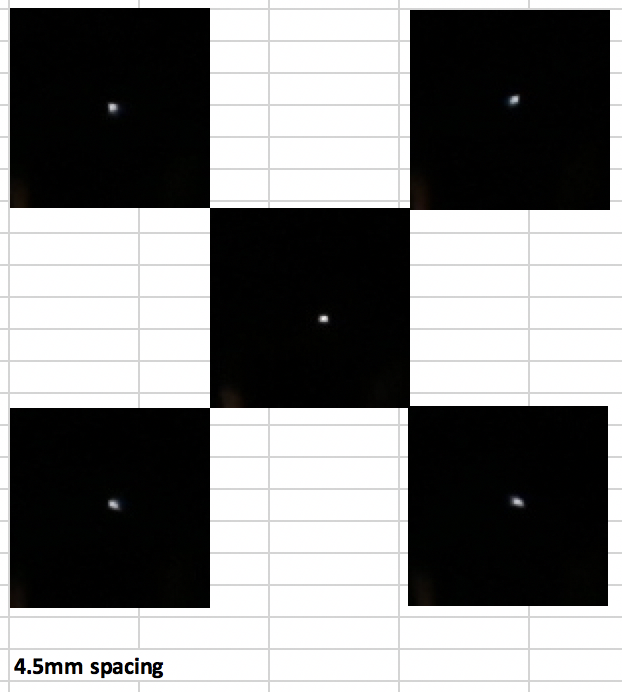 Because I already had the artificial star set up, I decided to see what star shapes look like off-axis on a Canon EOS 6D full-frame body. 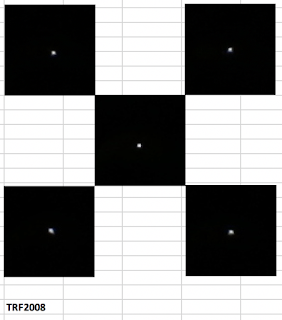 Note that this is a contrived test using a 50 micron artificial star, 8m away (because it's cloudy). It is not bad at all. Not too bad a showing for the Canon, I must say, given that the Canon is a 300mm f/4 (75mm aperture). The Lomo is the equivalent of a 384mm f/4.8 so not too far off. 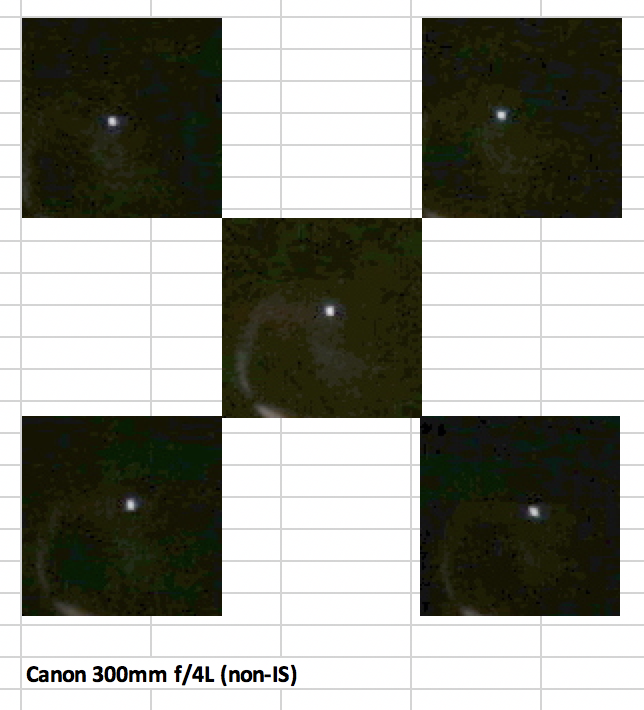 Conclusion: the Canon superficially looks capable of challenging the "best 80mm APO in the world" on full frame. This is the time-honoured Linux kernel benchmark. Preparation was simply unzipping the 4.20-rc3 tarball from kernel.org, running "make menuconfig" and immediately saving the config (no changes) and then make -j 4. This was on Amazon Linux 2, with a 40GB GP2 EBS block storage volume. So there we have it: on a kernel compilation, one run, the Intel instance completed the kernel compilation 25% faster. Update 13-Dec-2018. The new Z1D instance is supposed to be significantly faster than M5/C5/R5 due to sustained 4 GHz Turbo Boost on all cores. z1d.xlarge (also 4 vCPU) is 22% faster than m5.xlarge at uncompressing the kernel. also 23% faster. So it looks like for general purpose workloads (that are probably I/O bound) the Z1D only provides a 20% performance uplift. 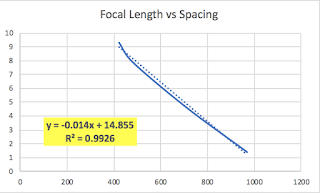 I've attempted to create a general formula for spacing of the William-Optics New Adjustable Flattener P-FLAT6AII here. I've also done some rudimentary testing of this flattener on a Lomo 80mm f/6 triplet as well. The key takeaway at the 480mm focal length is that this William Optics flattener performs better than the half-priced Orion flattener/reducer, but is marginally outperformed by the 20-year old design of the Televue TRF2008, at least in my testing with an artificial star that was quite close by, not at infinity. What about on the Astro-Physics AP130GTX, which has an 819mm focal length? 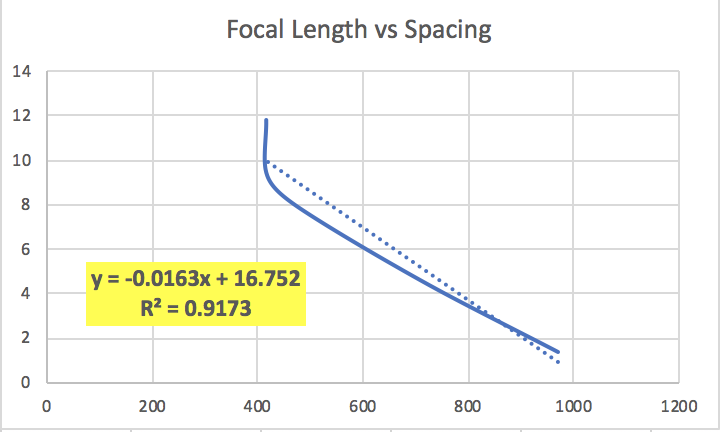 Based on William-Optics' tables, the closest focal lengths are the 970mm Z126, with a 1.4mm spacing, and the 711mm Z103, with a 4.6mm spacing. 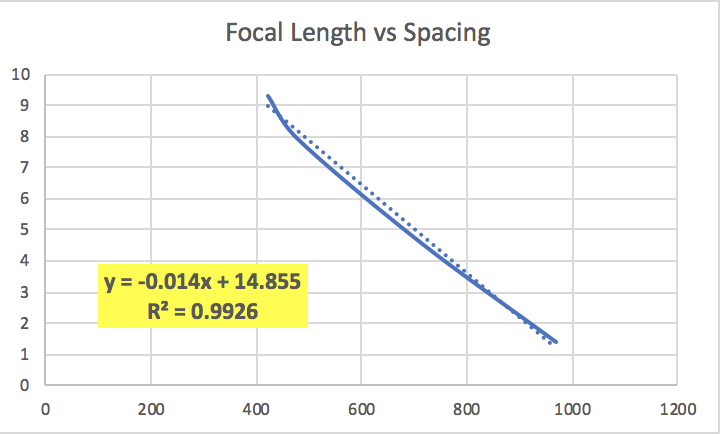 Neither is particularly close to 819mm, but using my least-squares approximation with m=-0.014 and b=14.855 a spacing of 3.4mm is obtained. 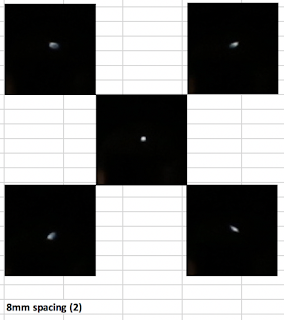 However, based on my previous experience with the Lomo, where the best spacing was around 2mm shorter than indicated by the table (may be caused by the artificial star not being at infinity) I decided to try several spacings of the Flat6 to determine the best one. First the AP130GTX with no flattener, on the corners of a Canon EOS 6D. Performance is decent, actually: the field curvature is much less than with the Lomo 80mm. 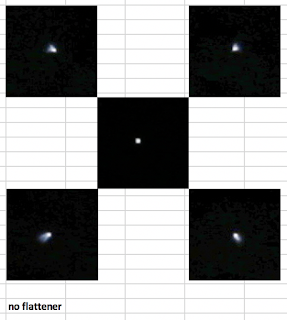 We do observe that there still are comet-shaped stars, although they are pretty tight. 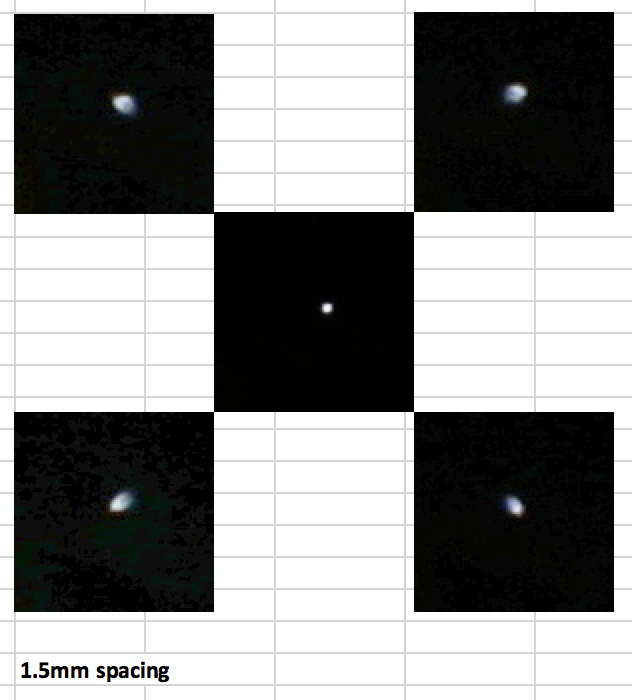 The Televue TRF2008 did very well with the Lomo, in spite of its 20-year vintage (it was released in 1999). It does not do quite as well with the AP130GTX, however, in spite of (supposedly) being designed for 400mm - 600mm focal lengths. The stars are not comatic, but they are quite eggy. The Flat6 supposedly is best at 3.4mm spacing. Here's 3mm. It's not great. 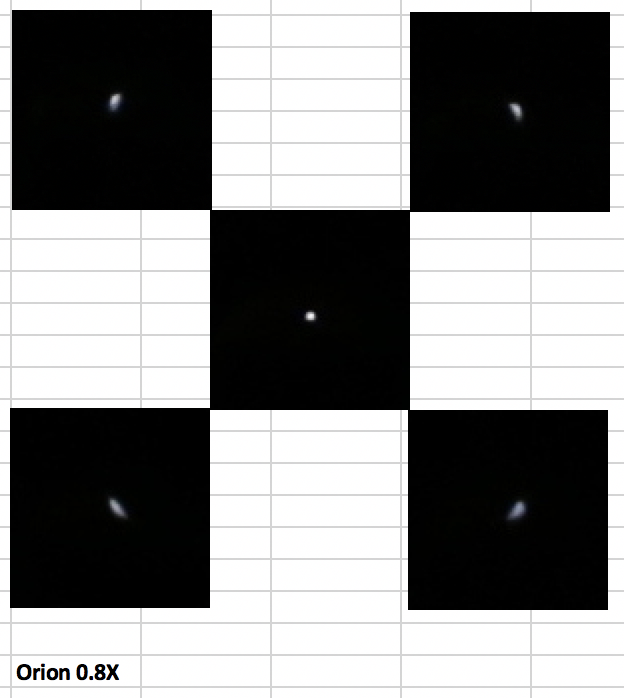 The stars are round (ish), but quite diffused compared to without the flattener. This could also be down to my technique or lack of it (that's a typo, the spacing is 3mm, not 3 meters). 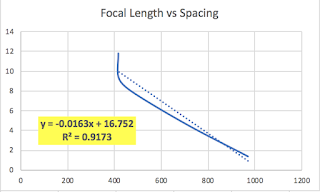 I decided to try an even shorter spacing of 1.5mm which would correspond to 900mm of focal length. 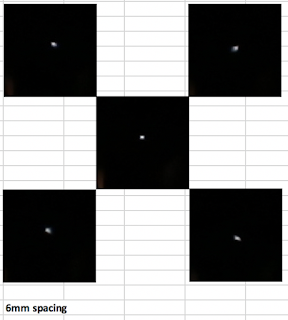 While the stars are tighter, they are less round than at 3mm, and show a bit of a comatic shape. I suspect that 3.4mm or 4mm is a better choice for spacing for the AP130GTX. But performance is still only tolerable. I guess that's why AP gets away with charging $825 for their dedicated flattener. 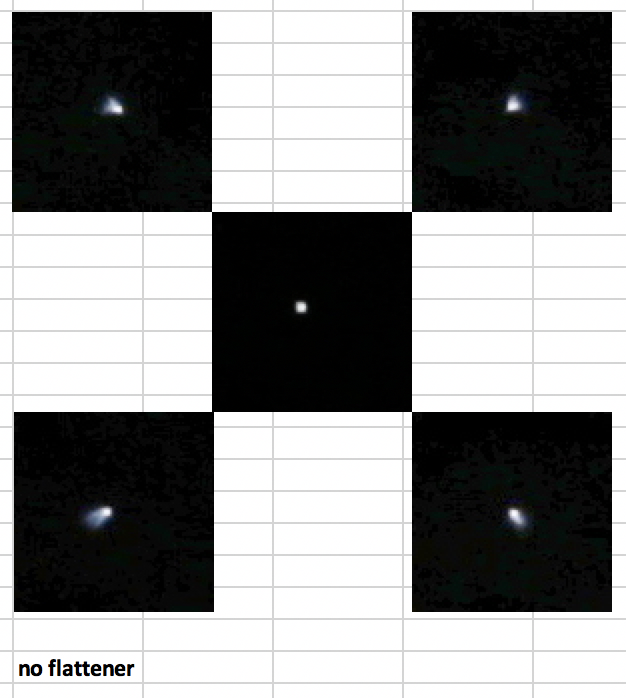 Some Hong Kong amateur astronomers have done their own testing of various flatteners with the Lomo 80mm f/6 Super-Apo. Their results can be summarized as such. 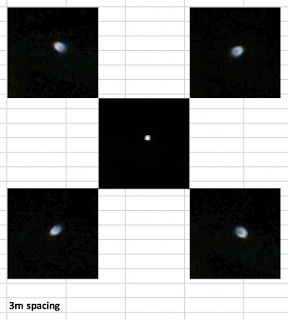 Note that the Televue TRF2008 performs the worst in their test (24m distance to artificial star). 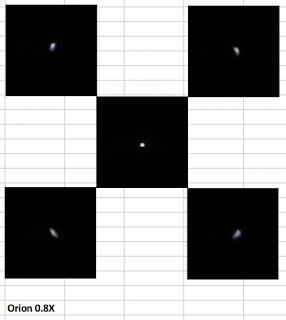 I recently purchased the William Optics New Adjustable Flat6A II which supposedly works with a wide variety of refractors. 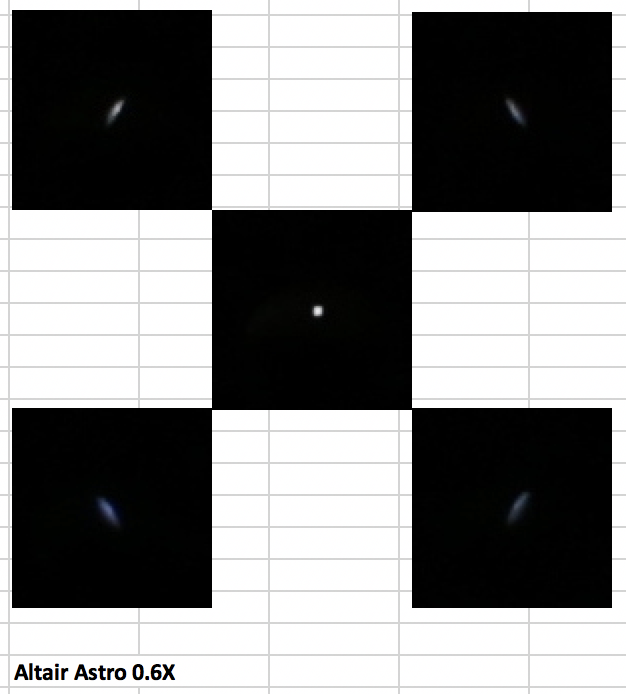 I've collected the recommended spacings from William Optics and generalized it to any refractor focal length. 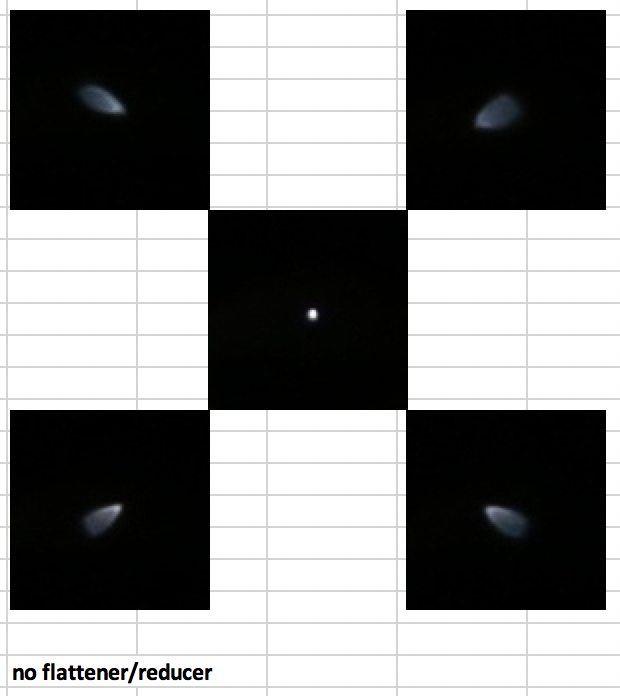 For this test, I'm using a Lomo 80mm f/6 Super-Apo with a Russian OK4 air-spaced triplet. 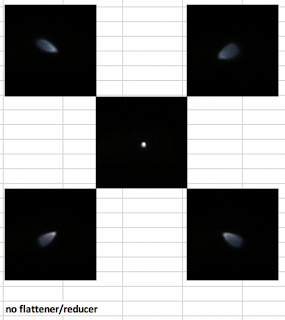 Due to poor weather, all testing was done indoors at about 8m distance (admittedly, quite close) and a Hubble Optics 5-star artificial star. I used the 50-micron (smallest) star for this test. The test images were captured with a Canon EOS 6D, which is a full-frame sensor and therefore somewhat of a challenge for these flattener/reducers. Do note that because the test was not conducted at infinity, it is not conclusive. First, the performance of the refractor without any correction at all. We can clearly see that there is quite severe field curvature. This performance is inadequate for even casual imagers. Performance is better than without any flattener, but still not that great. 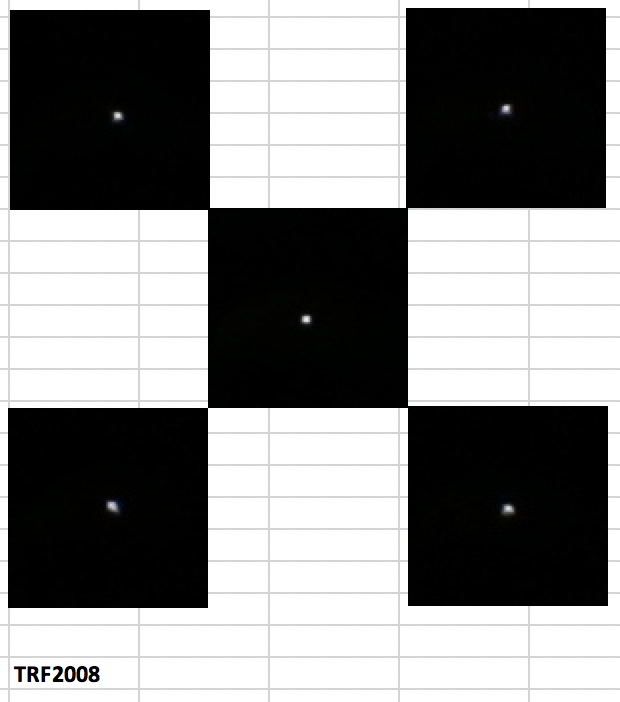 Note that this is at the corners of a full-frame sensor, so on a reduced-frame camera, performance would be much better. Now for the oldie-but-goodie Televue TRF2008 flattener/reducer for the TV85, which is designed for 400mm - 600mm focal lengths. This is a pretty good showing, significantly better than the Orion. 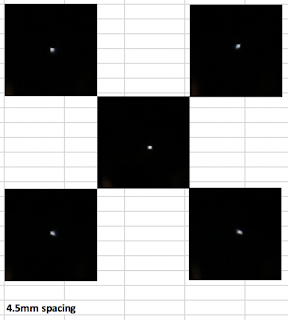 Suffice it to say, this is barely better than no corrector at all, however there is the 0.6X focal length reduction which may offset the ugly corner stars. Neither of them are very good. Definitely worse than the TRF2008. I tried spacings of 9mm and 10mm, with even worse results. With an 11mm spacing, I could not reach focus. This was almost certainly due to the artificial star not being at infinity. Performance is significantly better than at 8mm, and is almost though not quite as good as the TRF2008. Correction is almost the same as at 6mm. 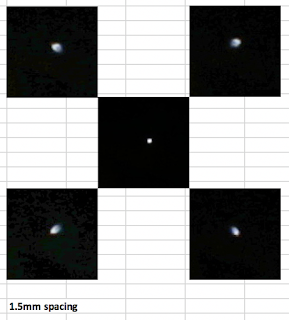 In general, the shorter the focal length, the more correction is required. And correction is increased by increasing the spacing. Interestingly, this Lomo 80mm f/6 triplet seems to need less field flattening than would normally be indicated. It is somewhat disappointing, however, that after all this drama, the Flat6 cannot surpass the 1999-era TRF2008. William Optics has a new adjustable flattener with (they claim) 97% of full-frame (43mm image circle) coverage for a wide range of refractors from around 480mm focal length, up to 970mm. This is almost certainly the replacement for the old P-FLAT4. There are several other adjustable flatteners such as the Long Perng one (which is cheaper). There is what I believe to be a typo. 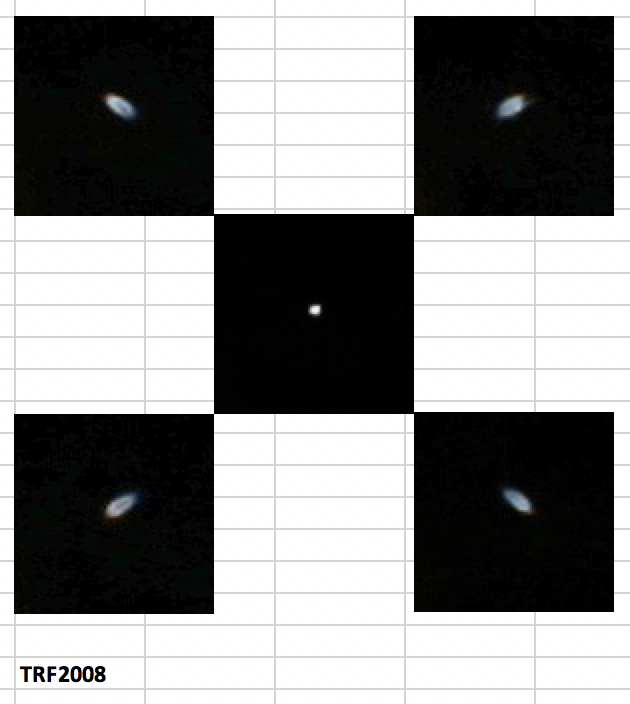 Field curvature for refractors (whether doublets or triplets) is proportional to the focal length only (not the focal ratio). 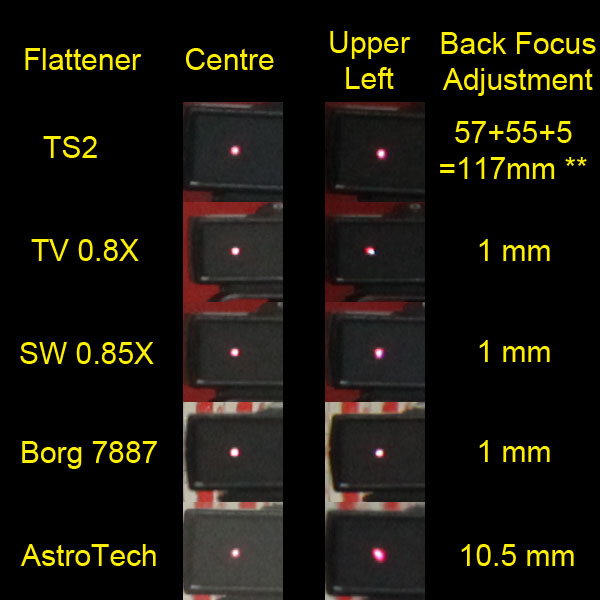 However we see in WO's suggested spacings that the Zenithstar 71 and Gran Turismo 71 which have basically equal focal lengths, have significantly different spacings. 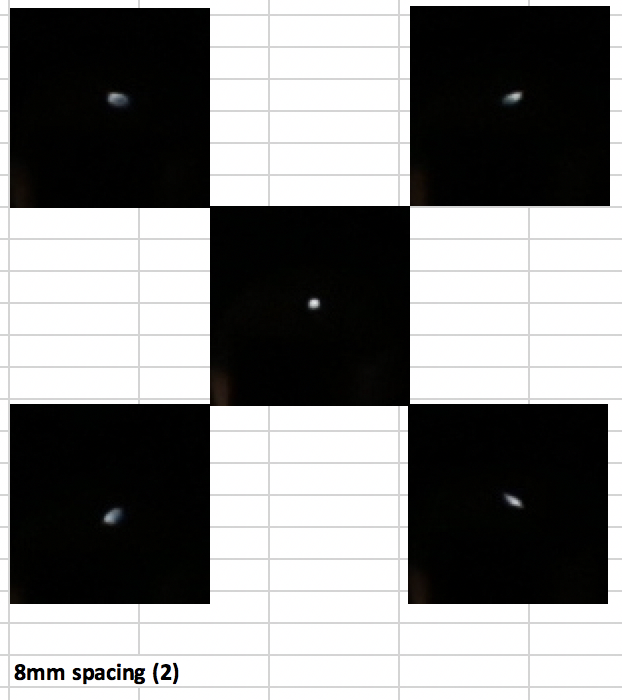 A much better fit (almost a straight line) with an R-squared of 0.9926. 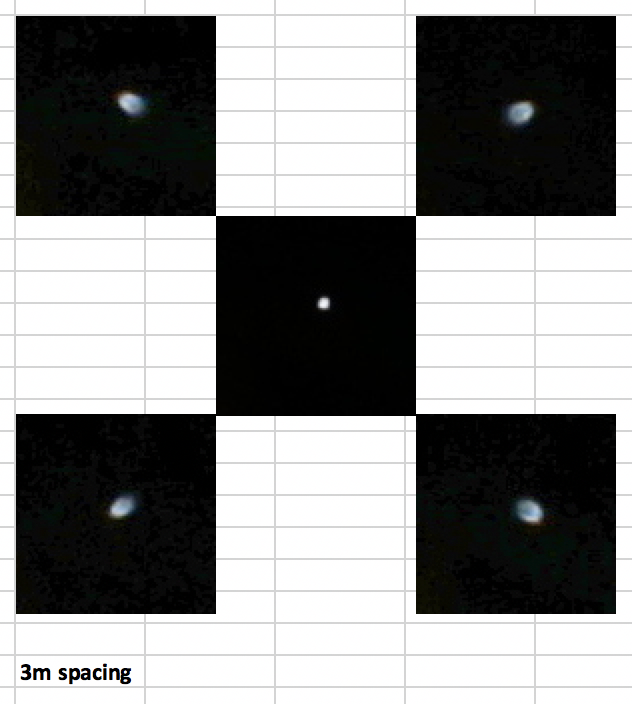 In summary: to determine the optimal spacing for your particular refractor, use m=-0.014 and b=14.855 (remember the formula, y = mx + b). Once I get my copy of the P-FLAT6AII, I will be able to validate if the above formula holds. The views expressed on this blog are my own and do not necessarily reflect the views of any current or previous employers.